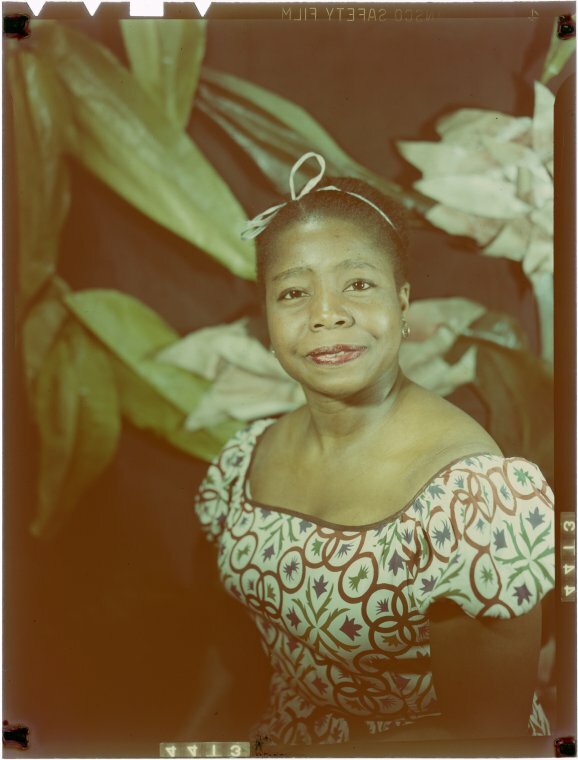 Living in New York, it’s not unusual to encounter ardent theater lovers who've carefully preserved decades worth of programs, tickets, and ephemera from every play they’ve ever seen. These collections can get a bit hoarder-y, as anyone who’s ever sorted through the belongings of a recently departed lifelong audience member can attest. If theater is dead - as gloomy Cassandras have been predicting since the advent of screens - these monoliths of Playbills and stubs constitute one hell of a tomb. 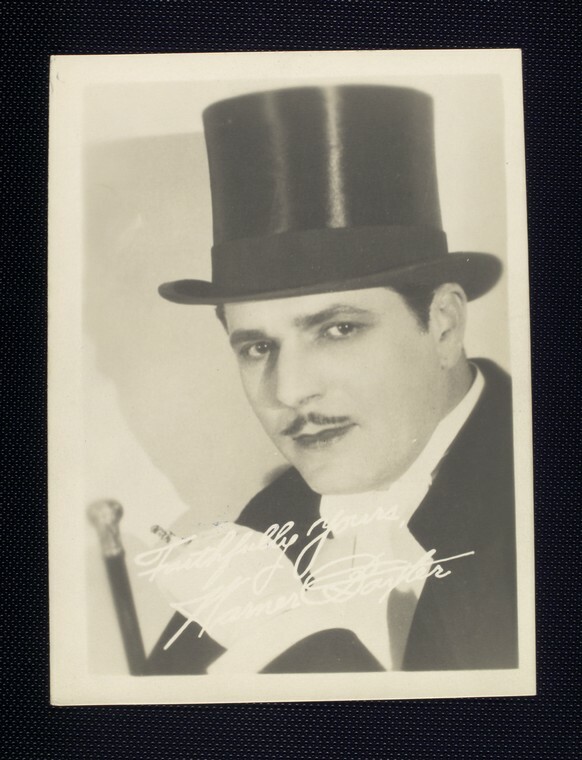 For those of us who conceive of theatre as a still-living entity, the New York Public Library’s recent decision to start digitizing its Billy Rose Theatre Division archive is cause for celebration. Such grand scale commitment to this art form’s past ensures that it will enjoy a robust future. 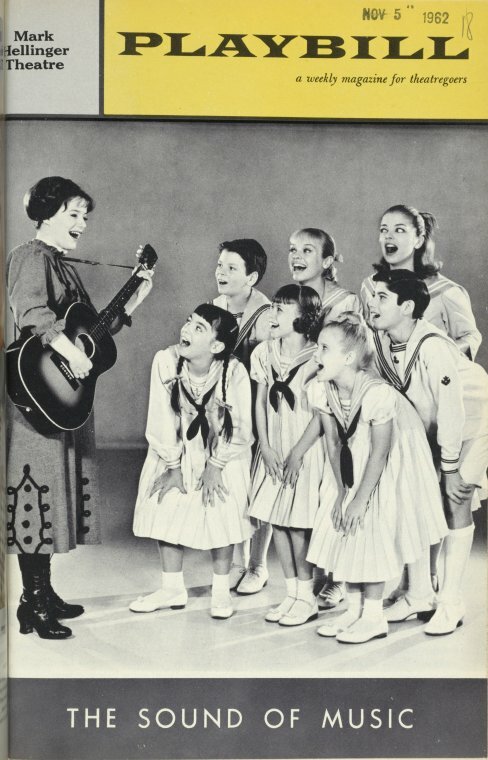 Hopefully someday all of the approximately 10 million items in the Billy Rose archive can be accessed from anywhere in the world. But, for now, you can start with over 100,000 items. The comparatively small percentage available now is still a boon to directors, designers, writers, and performers looking for inspiration. It’s also wildly fun for those of us who never made it much past playing a poinsettia in the second grade holiday pageant. 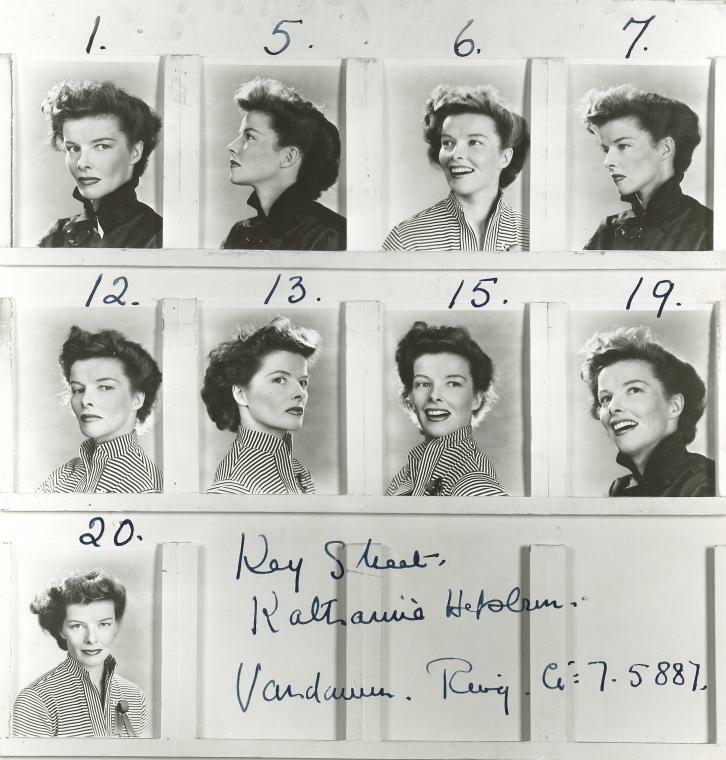 A researcher can examine a 1767 program for a performance of Romeo and Juliet in Philadelphia, study Katharine Hepburn’s personal papers (ed. note: witness the many moods of Kate, above), review Elia Kazan’s working script and notes for the original production of A Streetcar Named Desire, examine posters for Harry Houdini’s performances, read a script for an episode of Captain Kangaroo, view set designs for the original production of Guys & Dolls and costume designs for the Ziegfeld Follies, analyze a videotape of the original production of A Chorus Line, and find rich subject files and scrapbooks that document the most popular and obscure performances from across the centuries. You might also prowl for Halloween costumes. 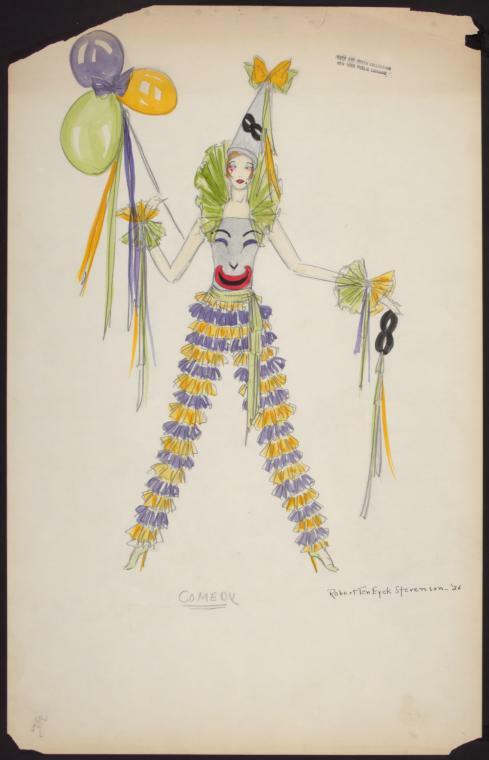 What kid wouldn’t want to trick or treat as one of Robert Ten Eyck Stevenson’s 1926 designs for the Greenwich Village Follies? 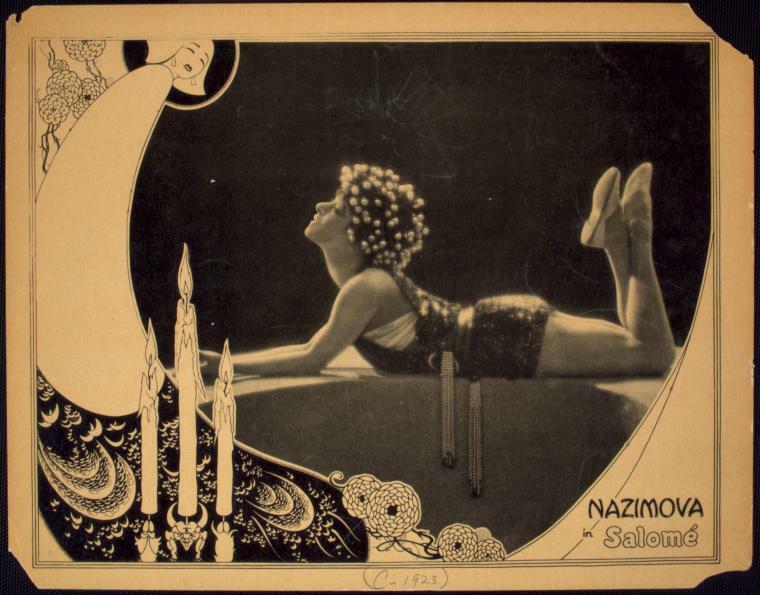 There's certainly no shame in mooning over a forgotten star… for the record, the one above is Alla Nazimova in Salomé. For me, the hands down pearl of the collection is the telegram at the top of the page. 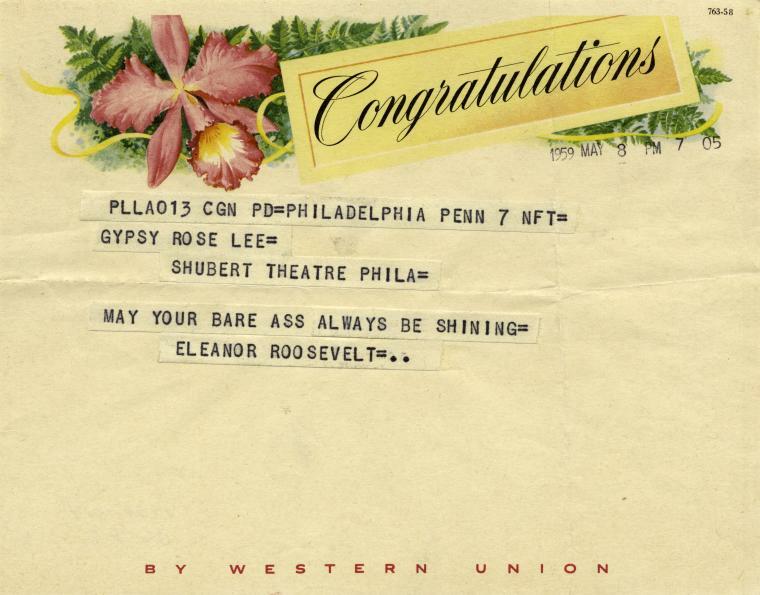 Former First Lady Eleanor Roosevelt sent it Gypsy Rose Lee to herald the re-opening of Gypsy, the musical based on her life. For the uninitiated, telegrams were once an opening night tradition, as was staying up to read the review in the early edition, hot off the press. More information on visiting the archive, online or in person, can be found here. So hard to believe that Eleanor Roosevelt would say that!